Okay, so it’s been a couple of months since I’ve updated this blog. Okay, several months. Give me a break. I’m not ready to let it die on the vine just yet, but I don’t have anything ready to post at the moment. So, to buy myself a little time and give myself a chance to play with embedding Issuu, a cool service that is available for publishing, I thought I’d post an article, or rather, series of articles I wrote a few years ago. Check it out and let me know what you think. 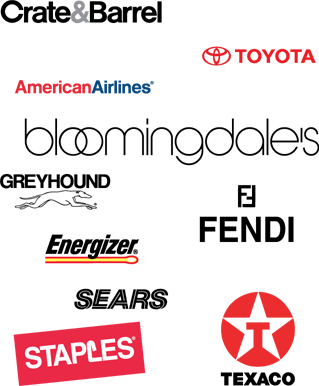 These articles first appeared in TechniScribe, Orange County STC’s award-winning newsletter. Edit: Of course the embed code doesn’t work on a hosted WordPress account, despite Issuu’s instructions, so you can read the articles here: Choosing Typefaces for your Cover Letter and Résumé. This article describes how to outline text in Adobe Acrobat X. 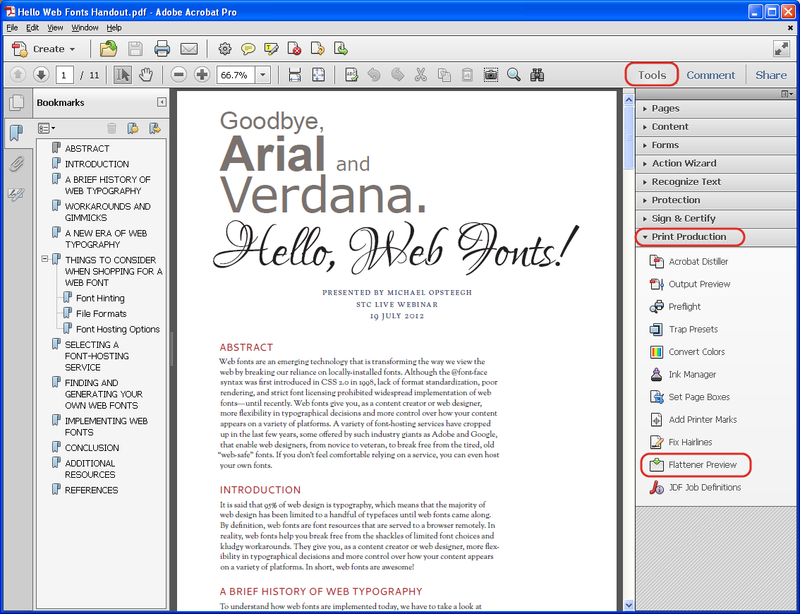 An older article has information about outlining text in Acrobat versions 7, 8, and 9. 16 April 2013: It looks like Adobe broke this feature with an update to Acrobat. Fortunately, a trick that worked in prior versions still works, but it adds a couple of small steps to the procedure. I have updated this article accordingly. By far, the most popular article on this blog is about outlining text in Acrobat, a task that became notoriously difficult after Acrobat 6.. An update post for Acrobat X is long overdue. Here’s the scenario I posed in my previous article on outlining text: you need to make a small change to a graphic file, the deadline is looming, all you have is a PDF, you don’t have access to the source files, and you don’t have the fonts installed. Without the fonts, you can’t open the PDF in Illustrator without jacking up the text. You can’t wait to get access to the source file because you’ll lose your place in your commercial printer’s queue. What do you do? The proposed workaround is this: open the PDF in Acrobat, outline the text, save your changes, open the PDF in Illustrator, and make your minor adjustments there. In Acrobat X, the process of outlining text is much easier than it was in versions 7, 8, and 9. Adobe restored the ability to outline text without having to fuss around with watermarks or other workarounds. The trouble is finding the feature. It’s buried in the Flattener Preview window, which is buried in Adobe’s answer to Microsoft’s ribbon based navigation. The text will retain its formatting, but will no longer be editable. If the PDF is going online, screen readers for the visually impaired will not be able to read it. If the problem you want to fix is textual, you’re pretty much screwed. You’ll need to edit the source files. Drag the Opacity slider to 0%. You’ll need to add a textual watermark before outlining the text. Kick the font size down and set the opacity to zero so the watermark doesn’t interfere with the appearance of your document. Accessing Flattener Preview can be a little tricky. The Flattener Preview window opens. Click File and select Save As to save your outlined text PDF as a different file from your original. You’ll notice that the text displays as it should, because it’s outlined. You can’t edit the text, but at least you can change the graphics to your heart’s content. Outlined text displayed in Illustrator. In this example, “Fonts!” is selected with the Direct Selection tool. What’s a Web Font, Anyway? For years now, web typography has suffered under the weight of severe limitations. Limitations of both technology and licensing restrictions have forced designers to rely on a handful of widely available fonts, installed locally on the end-users’ computers, and which resulted in the proliferation of such typefaces as Arial, Georgia, Tahoma, Times New Roman, and Verdana. To ensure that the integrity of a web page’s design would remain intact across a variety of web browsers and operating systems, designers relied on these few fonts because they could be found on a variety of platforms. Although web fonts are not a new technology (the @font-face rule was introduced on the CSS 2.0 specification way back in 1998), disparate font formats, reticent font foundries, and slow connection speeds prevented any significant use or development of web fonts. So, what is a web font? A web font is a font resource that is served to the web browser remotely. 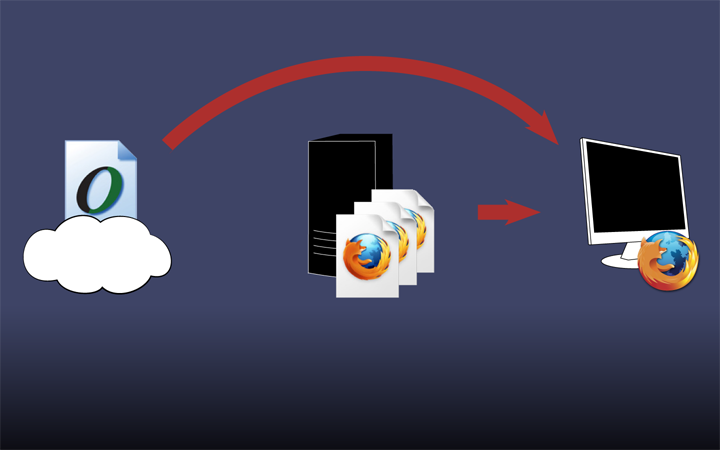 Sort of like an image on a web page; a reference in the HTML points to the image’s location on the web, and the image is then downloaded and displayed in the web page without the end user even having to think about it. By the same token, a web page’s CSS references the internet location of a web font, the font is downloaded, and the font is used to style the text that the user sees. Web fonts are resources called by a web page’s CSS, downloaded to user’s computer, and used to display the text on the page. The web font can be self-hosted by the owner of the web page or it can be hosted by a third-party service that specializes in serving fonts online. Font hosting services include Google Web Fonts, Adobe Typekit, Fonts.com, and more. In short, web fonts allow designers to break away from the tried and true (and boring) web-safe fonts and display text in the variety of typefaces we have become accustomed to seeing in print. I’ll discuss the various options for including web fonts on your web site on this blog over the next few weeks. If you can’t wait, you can sign up for my webinar on web fonts, which is happening July 19. 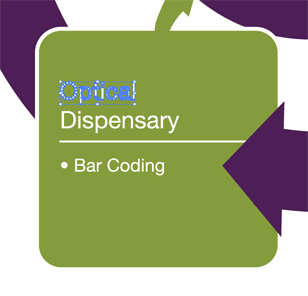 During a recent webinar, a couple of questions came up regarding interparagraph spacing. How much space is needed between paragraphs, and is it better to add space before paragraphs or after? Let me preface this post with a caveat: The paragraph spacing guidelines I provide here are based on the methods that have worked best for me. Your mileage may vary. I look forward to any comments and thoughts that you have, even if they run counter to my own. The amount of space required between paragraphs depends on your taste and sensibilities. In fact, you don’t need to add extra space between paragraphs at all. Interparagraph spacing does not affect legibility as long as there are other sign posts that signify a new paragraph to the reader. For example, indenting the first line of a new paragraph is frequently used in lieu of paragraph spacing. Type purists will tell you never to use both indents and paragraph spacing to indicate a new paragraph, but there’s no reason, beyond convention, that you can’t use both. Keep a heading closer to the paragraph that follows it. Keep a list closer to the paragraph that introduces it. In regard to whether it is better to add the interparagraph spacing at the beginning of a paragraph or after depends largely on your documents, but be consistent. This is an example of paragraph spacing being applied above and below. Notice that (aside from the first paragraph style) each paragraph style has more space above than below. Adding more space above ensure that lists appear closer to their introductory paragraph. Also notice that the list contains tighter paragraph spacing. Where I work, our paragraph styles contain both space before and space after. We add 9 points above and 6 points below normal paragraphs. Lists are a little tighter than that (4 points above and 4 points below). The first paragraph after a heading has zero points before, which enables that paragraph to align with the sideheads in FrameMaker. Many organizations have a dedicated paragraph style for the first paragraph in a section, because often the first paragraph contains a drop-cap or some other signpost that a new section or article is beginning. Incidentally, in both Word and FrameMaker, you can add space above and below paragraphs, and the software will reflect the greater of the two spaces. For example, if you have a paragraph with 6 points below followed by a paragraph with 9 points above, there will only be 9 points of space between them (not 15 points). That is the system that works for our publications. If you want to use space before and after, as we do, make the space before larger than the space after. This will ensure that your lists are in closer proximity to the preceding paragraph. InDesign users, beware! InDesign does not handle paragraph spacing the same way FrameMaker and Word do. InDesign adds the above and below spacing, so that 9-point space and that 6-point space will actually create a 15-point space. If you are using InDesign, I suggest that you be consistent in your application of interparagraph spacing: all above or all below. If you try to mix and match, you will only confuse yourself and others on your team. Michael Opsteegh presenting “Putting Your Best Font Forward” at STC’s 2011 Summit. Photo courtesy Jamie Gillenwater. Over the past several months, I have had the opportunity to talk to groups of technical and professional writers about improving the typography their documents. It has been an extreme pleasure to speak with these writers, and each group seemed eager to learn about typography and engaged in lively discussions. The presentation, “Putting Your Best Font Forward,” is essentially a semester-long course on typography crammed into to an hour or hour and a half and focuses on issues that seem to plague technical documentation. 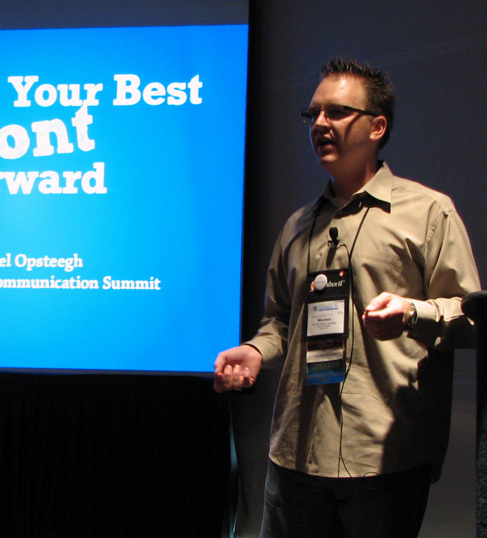 It was a supreme and humbling pleasure to be able to bring this presentation to the Society for Technical Communication’s 2011 Summit in Sacramento, California. The presentation was so well attended that I didn’t bring enough handouts, which was unfortunate, because I included a lot of practical information that could not be covered within the time limitations. To those of you in attendance who did not receive a handout, I owe you my sincere apologies. I am very grateful that you attended. You can download the slides and the handouts below. I hope to see all of you in Chicago in 2012! Recently, during a lecture I delivered to a group of professional writers, I commented that, in addition to choosing a well-designed font, professional-looking typography is the sum of all the little details in type treatment. As an example, I mentioned using prime marks instead of quotation marks to indicate feet and inches and using a real multiplication sign instead of an x. The puzzled looks and the multiple muddled voices murmuring “An x isn’t a multiplication sign?” told me that a lot of people don’t know the differences between these characters. The photo (below) on the left shows how many people type multiplication signs and inch measurements, with an x and with quotation marks. The photo (below) on the right shows a real multiplication sign and double-prime marks indicating the inches. The photo on the left uses an x and quotation marks. 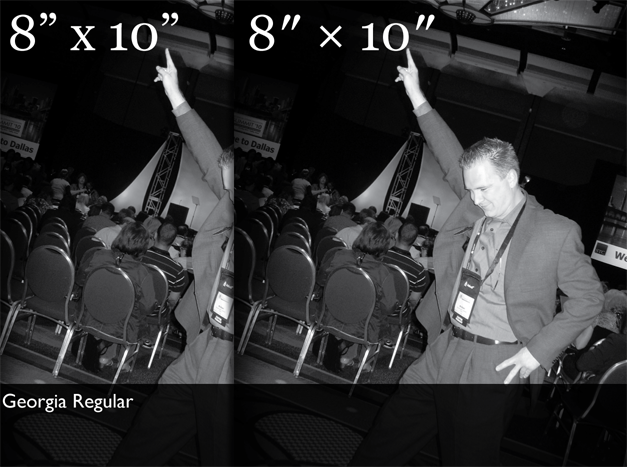 The photo on the right uses a multiplication sign and double-prime marks. Notice that the real multiplication sign does not have serifs, sits above the baseline, and each of the arms and legs are congruent. To type a real multiplication sign in Windows applications, press Alt-0215. In HTML, type &times;. Macintosh users, unfortunately, will need to select the multiplication sign from an application’s Character Palette or Glyphs Palette. Notice that the double-prime marks don’t curl like quotation marks (sometimes called “Smart Quotes” or “typographers quotes”). Typing double-prime marks for inches is easy. In Windows applications, press Alt-Shift-″. Macintosh users, press Control-Shift-″. In HTML, type &Prime; (note capital P). Typing prime marks for feet is just as easy. In Windows applications, press Alt-′. Macintosh users, press Control-′. 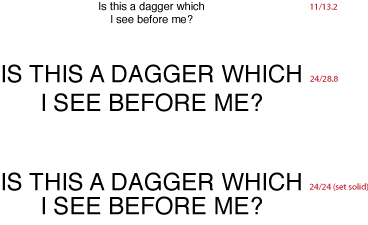 In HTML, type &prime; (note lowercase p). And now you have something new to talk about at the next cocktail party. 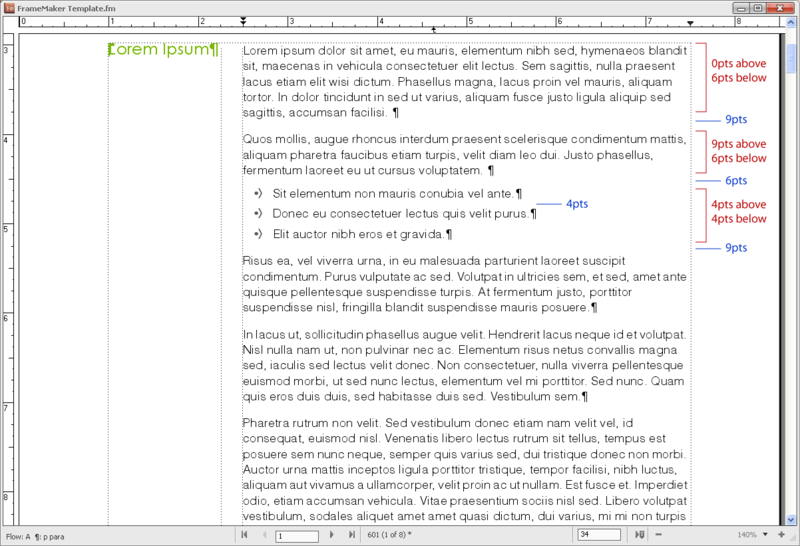 Update 27 July 2012: This article describes how to outline text in Adobe Acrobat versions 7, 8, and 9. 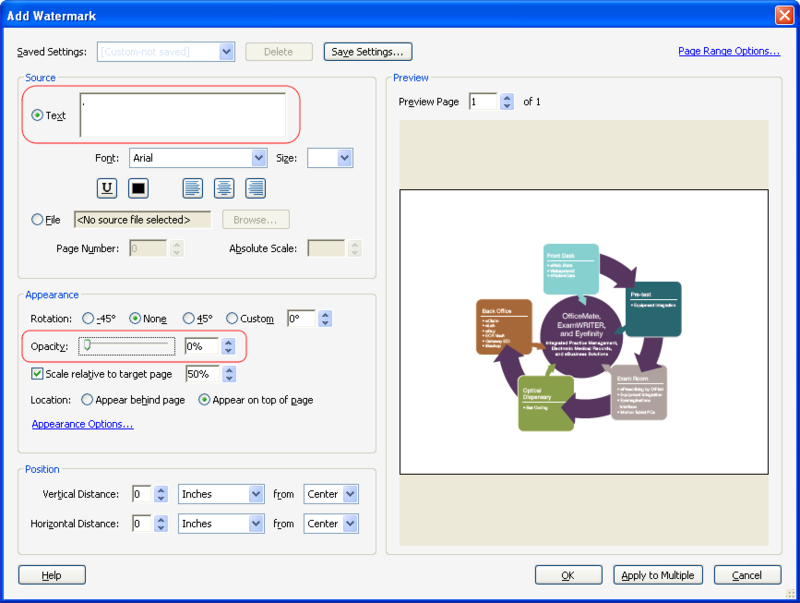 A newer article has information about outlining text in Acrobat X. Okay, this post does not have much to do with typography per se, but we’ve all been (okay, not all of us) in that situation where we need to replace a graphic or make a small change within a PDF or EPS file at the last minute. The deadline is approaching, the printer is waiting, your designer just left for a three-week vacation and took her files with her, or worse, your designer isn’t on vacation, but doesn’t understand what it is you want to begin with. So, you throw up your hands, figure you know enough Illustrator to get yourself into trouble, and decide it would be faster to fix it yourself. You open the PDF or EPS file in Illustrator, and what do you get? 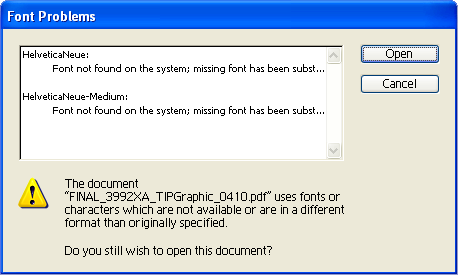 A message saying you don’t have the fonts installed on your computer. Of course! If you proceed by clicking Open, the type with the missing font will be reformatted using a font that you have installed on your system, thereby, undoing your designer’s beautiful typography. Whatever you want to fix isn’t worth that headache. What you should do instead is open the PDF or EPS file in Adobe Acrobat Professional or Extended and convert the text to outlines. 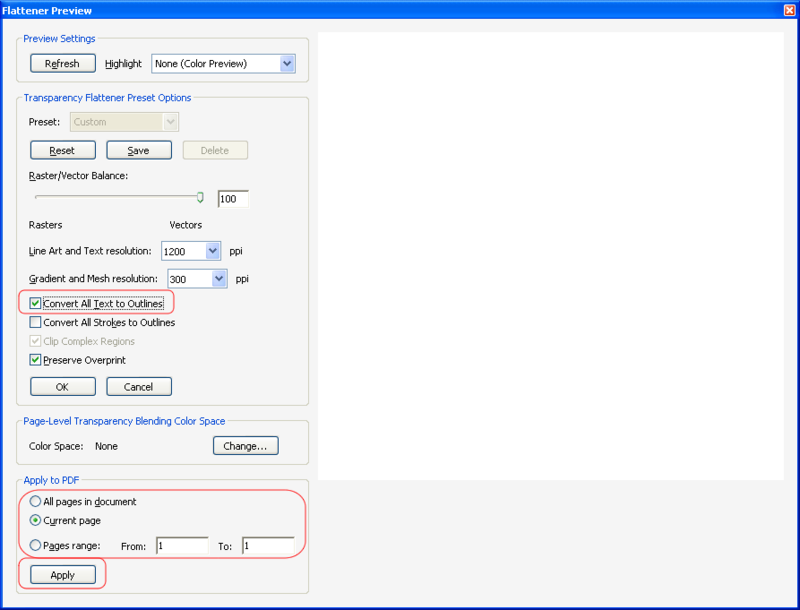 Click Document, select Watermark, and select Add. 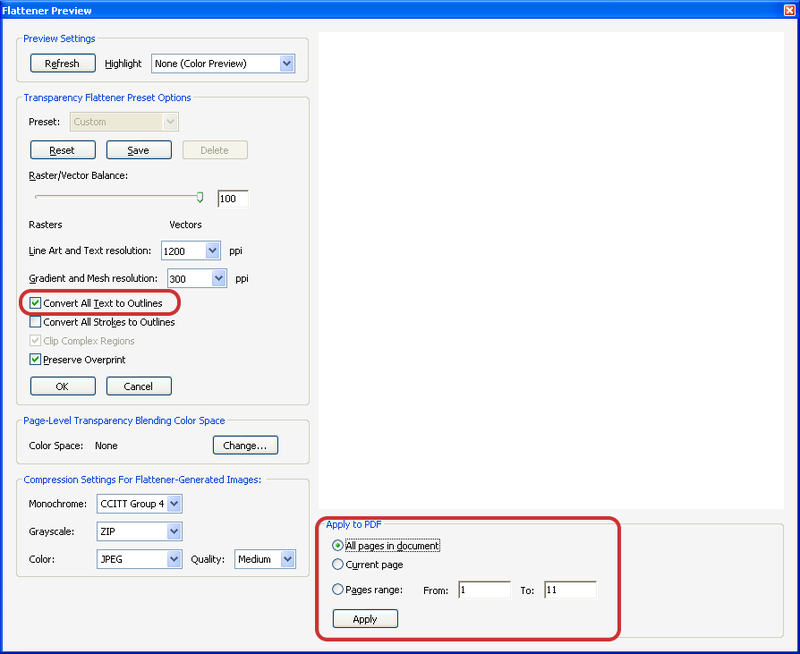 Click Advanced, select Print Production, and select Flattener Preview. To understand leading (pronounced “ledding”), you must understand where the term comes from. It’s called leading because typesetters used to manually insert metal strips, made of lead, between rows of type. The more leading the typesetter added, the more space that appeared between the lines of type. Leading is measured from one baseline to the next baseline. Leading is the space between lines of type. Technically, leading is measured from baseline to baseline. The default leading for body text is approximately 120 percent of the point size of the type. For example, 12-point type would be set with a leading of 14.4 points (written as 12/14.4). The default isn’t always appropriate. If fact, it’s rarely appropriate. Relying on default leading settings can get you into trouble. Headings, text set in large type, and text set in all caps requires less leading. Computer applications vary on how they measure leading. Some word processors like Microsoft Word measure leading as the difference between the type size and line height. For example, such design applications as Adobe InDesign, Adobe Photoshop, and Adobe Illustrator show type set at 12/14 as you might expect as 12-point type on 14-point leading. Word, however, shows type set at 12/14 as 12 points with 2 points of line spacing (which is essentially the same as 12/14). Note that paragraph spacing is different than leading in that paragraph spacing is the space between distinct paragraphs of text. Font Size. Normal text of 10 to 12 points is generally set with one to two points of line spacing. Smaller fonts require more line spacing to be legible. Likewise, large heading or display type will likely require less leading in proportion to the text size. X-Height. X-height is the distance between the baseline and median of lowercase letters. The larger the x-height, the more leading is required because the reader needs more space to recognize the word shapes. Line Length. Longer lines of text require more line space to prevent the eye from reading the same line twice. Lines of 75 characters or more should be double-spaced. Keep your body text between 35 and 70 characters for easy reading. All Caps. Type set in all caps requires less leading because there are no descenders hanging below the baseline, and therefore, there is no chance of collisions between the descenders of one line with the ascenders of the following line. Notice how fine print and disclosure statements commonly ignore these guidelines. Fine print is typically set in 8-point type or smaller, use a typeface with a large x-height, and little or no leading. Breaking with these guidelines makes the text unreadable, and, if you ask me, attorneys do this on purpose because they don’ want anyone to actually read the disclosures. Follow the guidelines I have outlined here when setting the leading for your own text. After all, you want people to actually read it. The only movie I’ve purchased from iTunes is documentary called Helvetica. Yes, I own a copy of a documentary about a font, or more precisely, a typeface, and yes, I am probably the biggest geek you will ever meet. Shut up. Helvetica, the typeface, is everywhere. You cannot escape it. It is ubiquitous. Every day Helvetica tells us, “Do not enter,” “Public Parking,” or “Watch your step.” The IRS uses Helvetica on our tax forms. The EPA uses Helvetica. The television and motion picture rating systems use Helvetica. Next to Times New Roman, Helvetica is probably the most widely used typeface on the planet. Many, many companies use some iteration of Helvetica as the typeface in their logos. As a technical communicator, I am fascinated by typography. Different typefaces can create different moods, reduce or improve readability, and affect the overall persuasiveness of a communication. Helvetica, however, seems to transcend these characteristics of type. It is neutral, efficient, and utilitarian. For example, the following corporate names probably conjure up different feelings within you: American Airlines, Staples, Bloomingdale’s, Greyhound, Sears, Fendi, Crate & Barrel, Energizer, and Texaco. All of these companies (and many more) have chosen Helvetica as their corporate logotype, and yet, we probably never noticed. When Helvetica was created for Linotype in 1957, it was an instant hit. Helvetica was clean and modern, and it was adopted by many corporations to modernize and revamp their images. Helvetica became even more popular when it was licensed by Apple and included with every Macintosh computer, and when Helvetica’s illegitimate (near identical, but not quite) twin, Arial, was included on every Windows PC. Legend has it, Microsoft created Arial because it was too cheap to license Helvetica. Whether this is true or not, I can’t say, but Arial has expanded Helvetica’s reach into our consciousness. Depending on the intent of your communication, you might want to steer clear of Helvetica—and Arial—unless you have a special need to assert your document’s neutrality or give your readers the impression that your document will bore them. If you get a chance to watch Helvetica, take it. You’ll get a better idea of how typography affects mood and readability, as well as the history of one particular typeface. Here’s a trailer to pique your interest even more. There are, perhaps, hundreds of thousands of computerized typefaces to choose from. I have some 800 type families on my laptop. All of these typefaces can be a bit overwhelming, especially to the untrained eye. 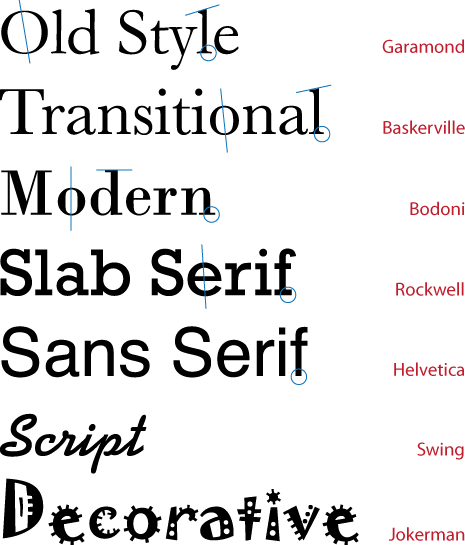 Fortunately, you can categorize most typefaces into one of seven groups. Granted, some typefaces will never easily fit into one category or another. There are seven main categories of type. The blue lines indicate the angles of the stress, the slope of the terminals, and the brackets of the serifs. Script. Script typefaces are designed to mimic handwriting and calligraphy. Decorative. Decorative typefaces are designed to add splash to your documents, but should be used sparingly. Outside of bullet characters, decorative type probably has no place in your résumé. Typeface styles are evocative. They’re reminiscent of the time and place in which they were created because they embody the art and architecture of the time and place of origin. Choose typefaces based on their associated mood and tone. More important than the tone of our document, your type should be suited to the utility of your text. You should chose typefaces that are appropriate for the situations in which they will be read. For example a weighty serif typeface is appropriate for road signs. Could you imagine speeding along the expressway trying to decipher a road sign written in a lavish script typeface? You couldn’t. Likewise, a typeface with heavy serifs would be difficult to read in the setup instructions for a home theatre, where the user is probably crouched in a tight, dark space as he plugs in equipment. So, you can see that the utility of your text will generally dictate the tone and the style of typefaces you use.